I am looking to get into bike touring, but I have a question regarding the bike-fit of a touring bike. I already own a (shopfitted) roadbike and mountainbike. The roadbike is a 60cm frame with stack/reach of 61.4/39.6 cm. However i am 193cm tall (6.3" ), with long legs 95.5cm (37,5 inch) inseam and short torso (most of length comes from the legs), but long arms. The roadbike is setup with about 10cm of handlebar drop. Which is fine for the the 6-8 hours a week i spend in the saddle. Additionally I have changed the stem from 110 to 100mm, to shorten the reach. So to what extend can I use this roadbike size as reference for sizing a touring bike? Obviously I don't want to be touring with 10cm of handlebar drop. It does seem most touring bikes come with slightly higher stack, +- 62-63cm. But then doesnt compensate the 10cm of drop. I could flip the stem to gain some height, or should I be going to a larger bike, to gain more stack, but also would negatively effect the reach? Last edited by 1nsane; 03-11-18 at 01:28 PM. comfortable all day long, riding either of them ? some shipped in, so I at LBS re assemble them..
Surly & Salsa are QBP brands, Kona , there .. you have a kona dealer shop to find..
that Kona dealer can also order QBP stuff .. lots of shops have their account..
so once there change stem saddle pedals and so forth to get the fit comfortable.. use measurements off the one you own. By the way you in NL why look at Taiwan bikes and not Koga, made in your country ? Gazelle , etc..
racks, kickstands, mudguards, battery light on the rear rack, I built the dyno hub wheel in the original rim..
since this picture 10 years ago headlight pedals & saddle changed ..
Last edited by fietsbob; 03-11-18 at 02:44 PM. It would be helpful to know what your road bike is to compare. I would avoid trying to use stack and reach - they are only useful for comparing bikes with very similar stacks. I would take a look at top tube lengths, keeping in mind that to compare two top tubes you might need to add 1cm for every degree of additional seat tube steepness. That said, it is common to sit on touring bikes differently than racing bikes to avoid the back stress of just sitting up higher on your road fit. Often touring fits slide the saddle to the rear so you keep some more lower back bend despite higher and closer handlebars. Of those three, the Surly is really small - the largest size has a short TT and a fairly low stack. The Kona is nearly 4cm taller in the largest size than the Surly and about the same TT length as the largest Salsa size offered. If you are leggy, having a tall bike can really make fitting easier. Have you tried asking your fitter which geometry of the three they would recommend? Current bike is a 2010 Trek 2.1. Effective top tube length would be 58.6cm on my trek vs for example 60cm on the 60cm Surly Disc Trucker. I forgot to mention it, but i'll be looking at 700c bikes, so Surly makes the biggest frames, up to 64cm (with a stack of 658mm). I think you were looking at the 26" frame sizes. Based on bikes listed, I assume you intend to undertake loaded touring, with panniers. You can credit-card tour (motels, no camping) on any unicycle/bicycle/tricycle, and you can convert almost any bicycle to loaded touring with a suitable cargo trailer (BoB Yak, Burley Nomad, etc). Road and touring bike fit are not similar, as the road bike is intended to maximize performance for relatively short periods, while touring bike is intended for carrying heavy load day after day over moderate distance, a situation which generally dictates slow speed (10-15 mpg average, 100-150 watts output) so that you're legs aren't shot after one or two days of touring. The weight of gear and aerodynamic drag of panniers force a slower pace regardless of age, motivation and fitness level. Stack/reach (S/R) are useful for comparing similar bikes (road A vs road B), but less so for dissimilar bikes (road vs mtb). S/R relates more to fit when riding out-of-saddle (for competition - S/R started with triathlon bikes) than fit when riding normally (seated). S/R does not measure the effective top tube length (ETT) or seat tube angle (STA). Consequently, one usually can't take road bike S/R figures and select a touring bike with published S/R and end up with the best fit possible. S/R fails to factor in ETT and overall reach needed to cycle comfortably from the saddle on a touring bike. So while S/R is a starting point, ETT is still fairly critical in determining fit. Furthermore, the R of S/R measures to the top of head tube (HT), but touring bikes are routinely fitted with a much more upright, comfortable posture, so that you'll normally see more spacers on a touring bike than a road bike. In this situation, the reach from saddle to handlebar shortens as the fork steerer tube lengthens (more spacers), at least on most bikes where STA is greater than HTA. Most any bike with 10cm of spacers will have 2-3cm shorter reach to the bar than the same bike with 0cm of spacers, which is never indicated by S/R figures alone. What many do in your situation is select a touring frameset/bike with a steel fork with long steerer tube, and combine with a shorter, steeper stem (8,17,25 degree etc). I own/owned Surly Disc Trucker (DT)/Surly LHT and know that when purchased as frameset, you receive an "uncut" fork (steerer tube is nominal length) before LBS mechanic hacks it shorter following fit. Only steel and aluminum forks can be used with lots of headset spacers above the headset upper cup - carbon steerers are limited to 30-40mm. I believe Surly Completes (their models sold as complete bikes) and Salsa Completes are also delivered to LBS with uncut fork. Make sure your LBS does not cut the steerer before fitting, if you go that route. Also, even after fitting, it is smart to leave fork uncut, because you may change your mind - and a new fork is $100-500, and may be available only in gloss black finish. You can buy/build a Surly or Salsa (made by same factory in Taiwan) with 10cm of headset spacers - it is done quite a bit (google "surly lht", click images tab). Add short stem and you can usually achieve desired bar height and reach. Surly LHT and DT (which have identical geometry for given nominal frame size) tend to be a little long in ETT, especially in the smaller sizes, which make fitting more difficult for folks with long legs/short reach - this is why there are so many drop bar LHT/DTs on google with lots of spacers and short (<100mm) stems. I suspect this will be less of an issue for taller folk, even the long legged ones. This is an intentional Surly design choice to accommodate building with either flat or drop bar. Note LHT/DT are sold in 26" and 700c wheel versions in all 10 frame sizes. 26" wheels are bit longer-lived and easier to source tires, it helps prevent toe-overlap on fendered bikes with larger tires (i.e. touring bikes), and the smaller wheel does not force unfavorable frame geometry on smaller sizes (steep STA, slack HTA, trail and handling issues). It is unlikely there will be toe-overlap on a 700c DT with 42mm tires/52mm fenders, size 60/62/64cm - unless you have huge feet/shoes. Salsa Marrakesh is offered in flat and drop bar versions with ETT sized more appropriately to intended handlebar configuration. Marrakesh comes only in 700c wheel, and it has swinging dropouts, which are great if you are the minority who use IGH drivetrain, otherwise it's an expensive, heavy, ugly frame complication which virtually forces all Marrakesh owners to purchase Salsa's proprietary short-height rack (included with Complete models). Standard racks will position panniers ~8cm higher on a Marrakesh because the swinging dropout pivot bolt also serves as the rack's lower mounting point, which is ~8cm higher than the normal rack mounting point on a bike with conventional vertical dropouts. The swinging dropout pivot bolt mounting location also moves the rack ~2cm further forward, shortening clearance needed to avoid heelstrike with panniers. Thus, Marrakesh has compromised the capacity to keep load center-of-gravity low with superior steel (Tubus) racks, and moved bags forward 2cm, so that <10% of it's owners can fit an IGH. If you don't like the "10-spacers" look on a LHT/DT, consider the Salsa Vaya. Vaya is a great choice for more stack and less reach. Stem-wise, consider the effect of length and angle; angle can shorten reach quite a bit by itself. Here's a good stem calculation tool to help visualize effect of length/angle change. I could go on, but basically fitting bikes well is a little complicated, touring bikes more difficult, and describing the process in forum posts harder still. If you buy a touring bike and have it fitted, be sure to buy from someone who sells and fits touring bikes regularly, because the guy who fits road bikes all the time will tend to fit you on a touring bike like it's a road bike. Last edited by seeker333; 03-12-18 at 11:18 AM. By the time you raise the bar on a DT to comfortable height, the 60cm ETT will shorten 1-3 cm. My guess is you'd also need to shorten stem 1-2cm. Go with a steeper stem if you don't like the looks of lots of spacers. However, I reiterate, avoid temptation to cut the steerer. Best thing to do in the beginning is use lots of spacers and a very short, -17 to 10 deg stem - this preserves steerer length while keeping bar in reach and not too high. Try the stem calc tool I linked in last post. BTW, LHT/DTs are the same geometrically for a given size, regardless of wheel choice. Another intentional design decision to make choosing the right frameset/bike easier. They're not identical in S/R between 26/700 versions but within an insignificant millimeter or two. 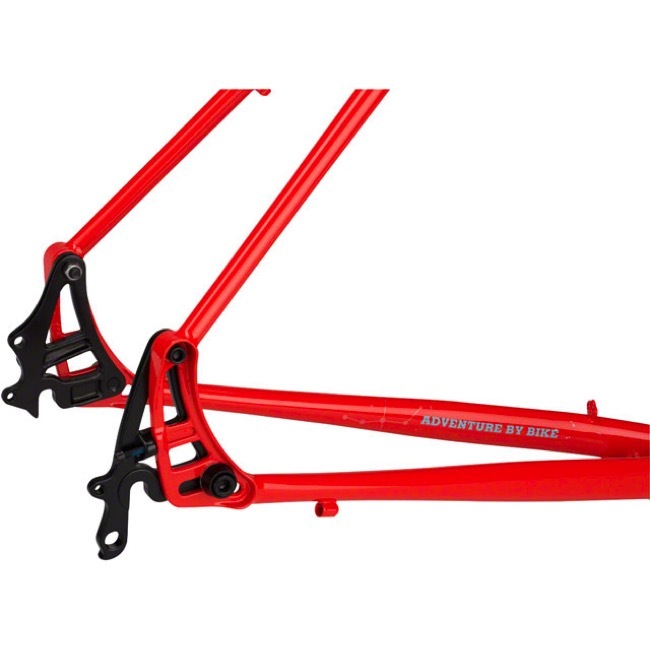 Email Surly to determine availability of desired frame size, although LBS can usually provide this information. Look at the Vaya if you're not happy with the numbers on DT. Look at the Marrakesh if you are content with Salsa's Al rack or are considering a Speedhub drivetrain. I've got a XL Cannondale T2 and thought that was a good fit and some years later bought a carbon XL Specialized Roubaix and that's even a better fit, but it was dialled in with the fitting machine. I commute on a flat bar bike and jumping on the Roubaix feels like home, whereas it takes a little while to settle into the Cannondale. If you're not sure, look at the modern comfort road bikes, like the Roubaix, Domane, because they've put a lot of effort into getting the geometry correct. I am only going to mention two minor points since you already have a lot of good comments. 1. Different handlebars have different reach characteristics, on my bikes the fore to aft distance from where the stem is attached to the handlebars to the hoods of the brake levers varies by about 37mm. So, when you make your comparisons from one bike to another, make sure you don't stop at the stem, for example you could measure from the saddle to the brake hoods to take handlebar reach into account. And if you bought a bike with too much reach, besides stem changes, a handlebar change is another option if you mostly ride on the hoods. 2. Stems are available with high angles. I think I have a 35 degree stem on my expedition bike. Mine is an XLC brand, I do not know if they are available in Europe. Insane, very good points brought up by seeker etc. Let's start with a question or two-- your rough age and if you intend to go the pannier route? Main points of higher seat to bar drop because of lower speeds and lower power output over long days riding and consecutive riding days, are the main reason for diff touring vs roadie setups. Last edited by djb; 03-11-18 at 09:00 PM. I would compare the effective top tubes of your current road bike and the touring bike. It's a lot easier to adjust handlebar height than top tube length. Between my road bike and touring bike, there is 10mm difference in top tube (my road bike is actually shorter). I had quite a few spacers under my stem to get the bars high enough; this is normal. If you can stand over a larger size, you should seriously consider it. I am on a 50 cm Disc Trucker and based on my road bike, I almost bought a 46. I'm glad I went with the 50. You might need a 62. I differ from others here in that seat to bar reach is important, and touring usually is going to be more comfortable slightly closer and higher than a road bike. But as mentioned, stems can change stuff a lot, but it's easier putting on or finding a 90,100,or 110mm stem than a 50. But that said, a short stem works fine also, one of my bikes, a surly troll, uses a 55mm stem and handles great. The troll and trucker I believe, have longer tt than other bikes, so be aware. I tour on the same setup I use for long sport rides of 100-250 miles. I'm adapted to it, it produces the most speed for least effort and greatest comfort. I have 6 cm. of drop and a good bit or reach. With horizontal forearms, my elbows are in front of my knees on all my bikes. One spends years dialing in a comfortable fit. Why would one change it? pointless to try to answer at this point, you need to provide some more information. *will you be fully self-supported with tent and cooking gear? or plan to stay in hotels? *will you be touring on roads in developed countries, or going off-road in africa? *what about terrain? flatlander or highlander? *going on weekend tours? 2-week tours? around the world in two years? whereas many bike tourists do that daily. hopping on aircraft? need a frame that packs small? Certainly the most speed for the least effort comment is a valid one, I figure the fellow really needs to assess his road bike position and try to be realistic of how it will translate to a touring situation, for him. I too find a similar drip bar position to be the most efficient on both my drop bar bikes. The slightly higher bar position on my troll has been appreciated on bad roads, on which I've ridden a lot lately. And also when feeling tired or run down. Plus I ain't 25 any more, and in general as we get older., most of us are less flexible overall. But in the end, there is no absolute right or wrong answer here. For sealed road touring size up and shorten the handle bar drop. Big bikes are beastly to transport. Traditional lugged bikes can get a bit flexy in the large sizes. My on road touring/commuter for the last 22 years has been a jumbo cdale and I love it. What many do in your situation is select a touring frameset/bike with a steel fork with long steerer tube, and combine with a shorter, steeper stem (8,17,25 degree etc). I own/owned Surly Disc Trucker (DT)/Surly LHT and know that when purchased as frameset, you receive an "uncut" fork (steerer tube is nominal length before LBS mechanic hacks it shorter following fit. Only steel and aluminum forks can be used with lots of headset spacers above the headset upper cup - carbon steerers are limited to 30-40mm. I believe Surly Completes (their models sold as complete bikes) and Salsa Completes are also delivered to LBS with uncut fork. Make sure your LBS does not cut the steerer before fitting, if you go that route. Also, even after fitting, it is smart to leave fork uncut, because you may change your mind - and a new fork is $100-500, and may be available only in gloss black finish. You can buy/build a Surly or Salsa (made by same factory in Taiwan) with 10cm of headset spacers - it is done quite a bit (google "surly lht", click images tab). Add short stem and you can usually achieve desired bar height and reach. Surly LHT and DT (which have identical geometry for given nominal frame size) tend to be a little long in ETT, especially in the smaller sizes, which make fitting more difficult for folks with long legs/short - this is why there are so many drop bar LHT/DTs on google with lots of spacers and short (<100mm) stems. I suspect this will be less of an issue for taller folk, even the long legged ones. This is an intentional Surly design choice to accommodate building with either flat or drop bar. Note LHT/DT are sold in 26" and 700c wheel versions in all 10 frame sizes. 26" wheels are bit longer-lived and easier to source tires, it helps prevent toe-overlap on fendered bikes with larger tires (i.e. touring bikes), and the smaller wheel does not force unfavorable frame geometry on smaller sizes (steep STA, slack HTA, trail and handling issues). It is unlikely there will be toe-overlap on a 700c DT with 42mm tires/52mm fenders, size 60/62/64cm - unless you have huge feet/shoes. Salsa Marrakesh is offered in flat and drop bar versions with ETT sized more appropriately to intended handlebar configuration. Marrakesh comes only in 700c wheel, and it has swinging dropouts, which are great if you are the minority who use IGH drivetrain, otherwise it's an expensive, heavy, ugly frame complication which virtually forces all Marrakesh owners to purchase Salsa's proprietary short-height rack (included with Complete models). Standard racks will position panniers ~8cm higher on a Marrakesh because the swinging dropout pivot bolt also serves as the rack's lower mounting point, which is ~8cm higher than the normal rack mounting point on a bike with conventional vertical dropouts. 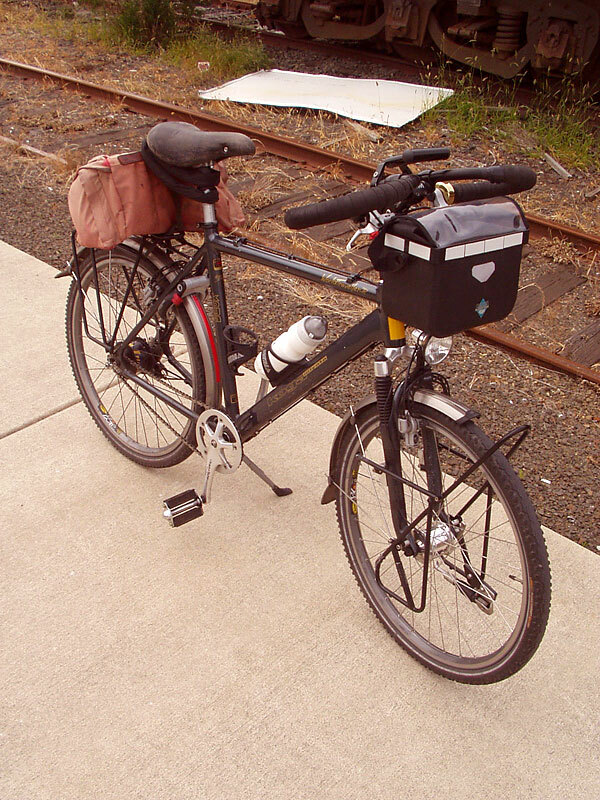 The swinging dropout pivot bolt mounting location also moves the rack ~2cm further forward, thus shortening clearance to avoid heelstrike with panniers. Thus, Marrakesh has compromised the capacity to keep load center-of-gravity low with superior steel (Tubus) racks, and moved bags forward 2cm, so that <10% of it's owners can fit an IGH. Stem-wise, consider the effect of length and angle; angle can shorten reach quite a bit by itself. Here's a good stem calculation tool to help visualize effect of L/A change. Personally I find my road bike to be supremely comfortable. When touring, I try to duplicate my road bike riding position as closely as possible, including having the bars ~10 cm below the saddle. I don't think that many folks take that approach, but it works for me. Thanks everyone for their input, especially seeker, for pointing out the Salsa Marrakesh situation. Currently trying to locate a possible testride on the Kona Sutra and the Surly. Not easy over here in Europe. For anyone wondering why i'm not looking at brands like Koga, Gazelle etc. Koga starts @ at a much higher price (+40-50%) and i'm looking for disc brakes. Koga does offer that, but then you are looking at the 3k+ range. Gazelle doesn't offer disc brake solutions. Additionally, I was planning on buying a frame and parts separately then building it myself, so I end up with what I want. even here Surly/Salsa have to be paid for before shop gets them, no credit line.. so that keeps most shops from having one on speculation. the company builds according to their customer's order. CAD Drawings Specs, Etc. they are a big player in the Biz..